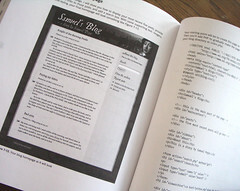 I think it’s high time I told you about my new book; or rather our book, Blog Design Solutions. 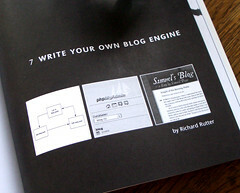 Andy Budd, Simon Collison, Chris J. Davis, Michael Heilemann and John Oxton all contributed a chapter showcasing a great new blog design for a different blogging engine. Conceived and introduced by Phil Sherry, the book is perfect for anyone wanting to get the most out of Moveable Type, Textpattern, Wordpress or Expression Engine. We’re all agreed that David Powers’ chapter on setting up a local development environment for your blog (on Windows or Mac) is worth the admission price alone. And what of my chapter? 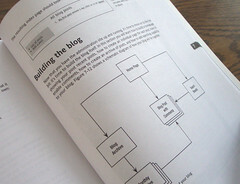 Well I’ve explained how to build your own blogging engine using PHP and MySQL – in other words you’ll learn how the content management system underneath Clagnut was put together. I’m particularly pleased with the Samuel Pepys inspired design (ably assisted by my brother) which you can see in action. Some have asked what the point is of building your own blogging engine – after all Blog Design Solutions highlights four perfectly honed off-the-shelf systems. Well I would say ‘because it’s fun’ and it’s also a really fulfilling way of learning MySQL and PHP. And if you fancy buying the book (or indeed any technical book), please do so through an author’s Amazon affiliate link – such is the world of technical writing that even a single author would get more money from the Amazon commission than from the book sale itself. I’ve just come back from a week with Her Indoors in the West Country. While there I bought five books, all of which were Penguin paperbacks, one of which proved to be particularly fascinating.